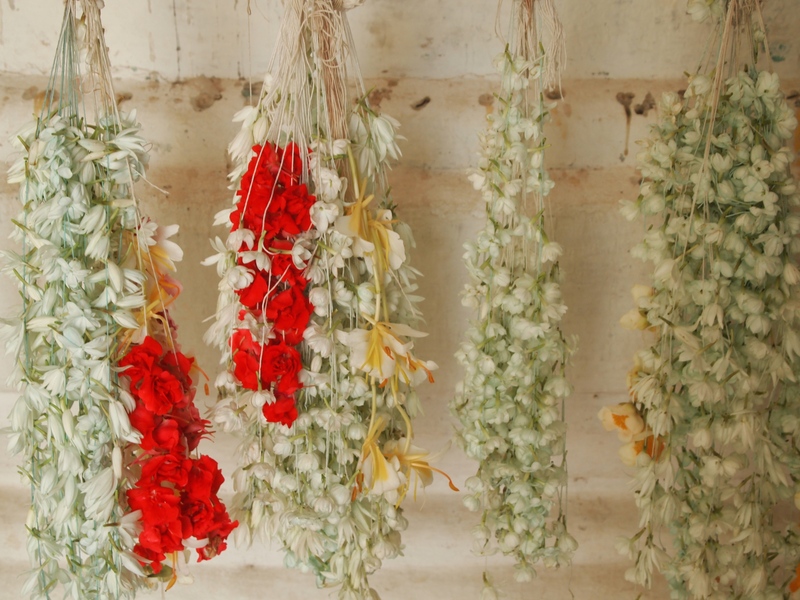 Tuesday, February 17: Today, my second day in Myanmar, is where my true journey begins. My first day was a whirlwind of activity, from visiting temples to taking a horse-cart ride through a former kingdom to walking atop a long teak footbridge at sunset. It was fascinating and fun, but I felt like a tourist rather than a traveler. I wasn’t changed or transformed. It was just me, Cathy, the same mundane person I’ve always been, making the rounds in an exotic culture: I was the person who crosses things off a list, who was wary of being ripped off and was easily annoyed by people who beat their horses or held me captive or snapped at me for honing in on the “model they paid for.” I didn’t think these were right behaviors and I was vocal about my intolerance of them. I don’t think my behavior in response to these annoyances was horribly wrong, but I wasn’t my best. Today, I am transformed. I become someone else entirely. I become someone exotic, someone daring and laid-back at the same time. This is when I start to feel like my heroine, Freya Stark. She was a British explorer and travel writer who lived from 1893 to 1993. She wrote more than two dozen books on her travels in the Middle East and Afghanistan, as well as several autobiographical works and essays. She was one of the first non-Arabians to travel through the southern Arabian Deserts. Her book, Passionate Nomad, inspired me to become a traveler. Today, I really begin to feel like one. The day begins in the breakfast room at the Mandalay Inn, where I meet a young Korean man named Peel. He asks if he can join me at my table, and we share stories of our travels. He travels for cultural experiences, immersion into the daily life in a place; the epitome of his travels was attending an African-American church service in south Chicago, where he clapped and swayed and sang hymns with vigor and passion. I know many Koreans, and an African-American church is not where I’d envision them feeling at home. This is the kind of experience Peel lives for. 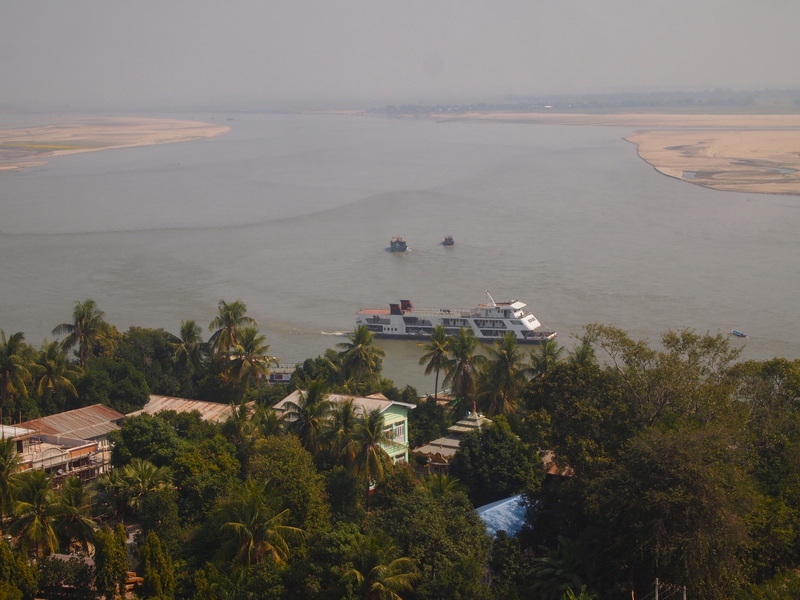 At breakfast, Peel and I discover that both of us are going by ferry down the Ayeyarwady River early tomorrow morning. 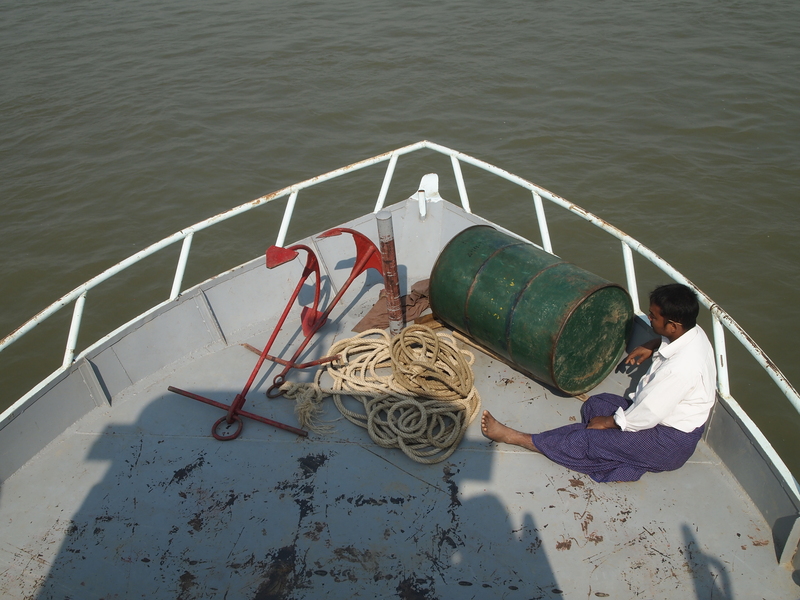 The boat ride will take around 10 hours. 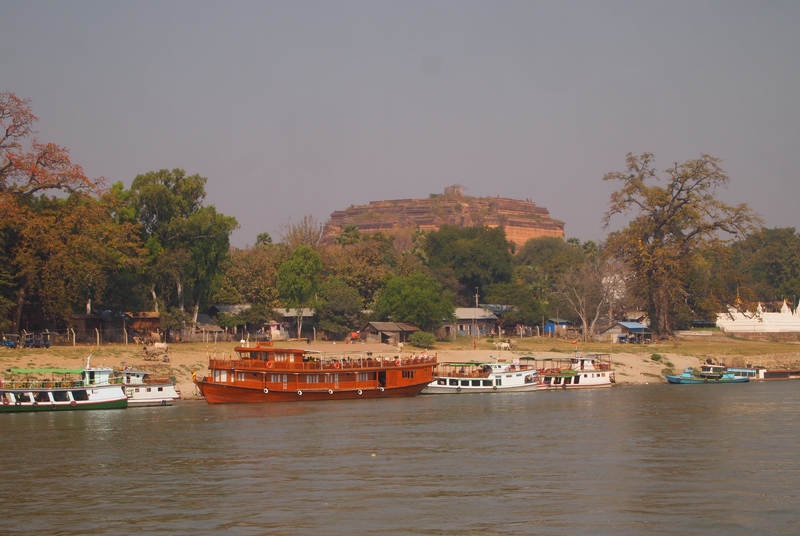 It’s the slow route to Bagan. He’s booked on a different boat than mine, so we check with the front desk and find the jetties where the boats take off are not far from each other. Thus we both arrange to share a taxi tomorrow morning; he will get dropped off first, then the driver will take me to my jetty. 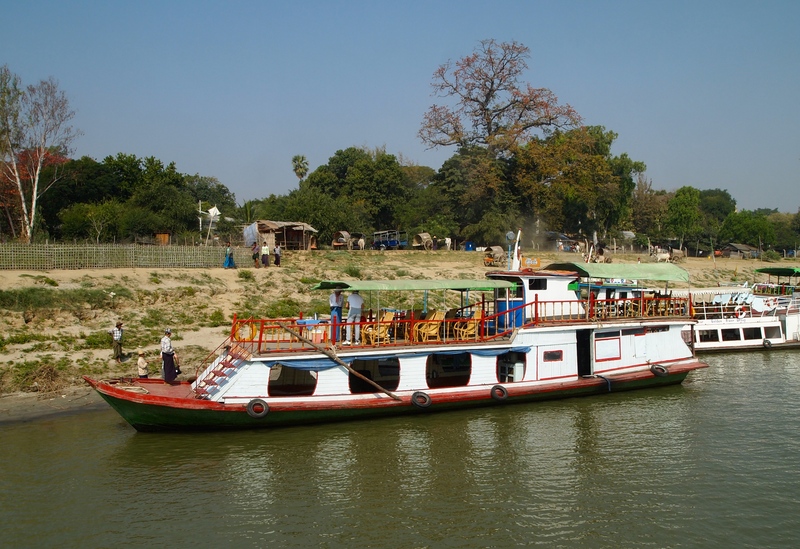 I’ll be on the N Maikha Shwe Keinnery Boat, while he’ll be on another. We find we need to be ready to leave our hotel by 5:45 a.m. for check-in at the jetty at 6:30. However, that’s tomorrow, and there’s still the day ahead to explore. 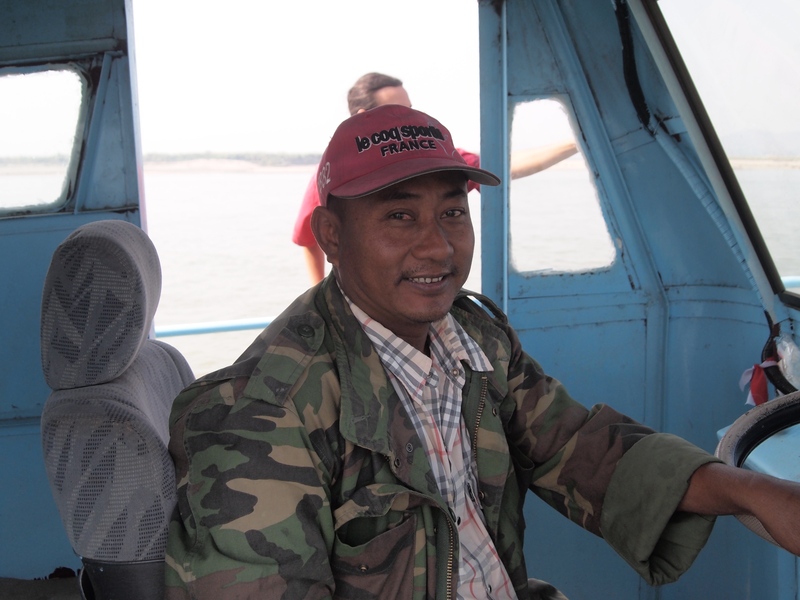 Peel and I part ways and at 8:20, my driver Mimo picks me up at the hotel and takes me to a jetty in Mandalay. 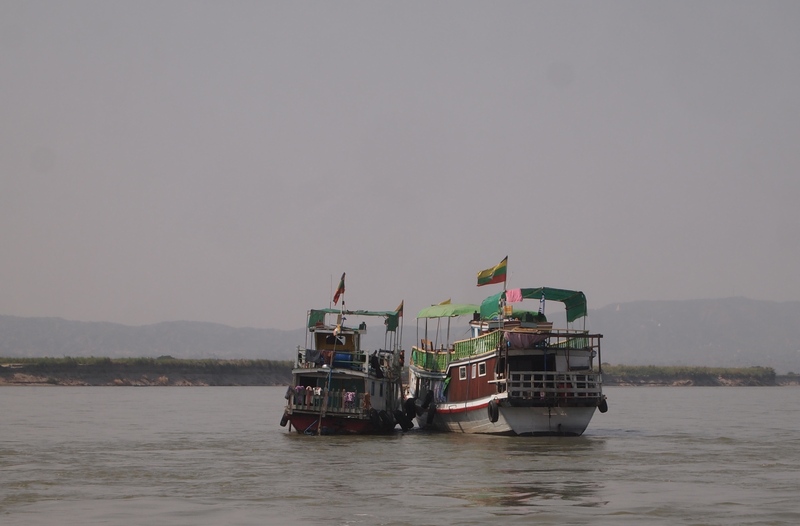 Here, I get on a boat down the Ayeyarwady River to Mingun and I begin to relax into a pace of life that I don’t think I’ve experienced since I was a child. I feel like I’ve gone back in time by at least 50 years, possibly more. This is where I fall in love with Myanmar, or what I still like to think of as Burma, and from this morning until I arrive in Yangon, my love affair with this country deepens and expands and fills my soul. I become a traveler from the early 20th century, someone exploring before modernization, before places were ruined by tourism. I’m a time traveler, an adventurer, an open book waiting to have my experiences written upon the pages of my life. 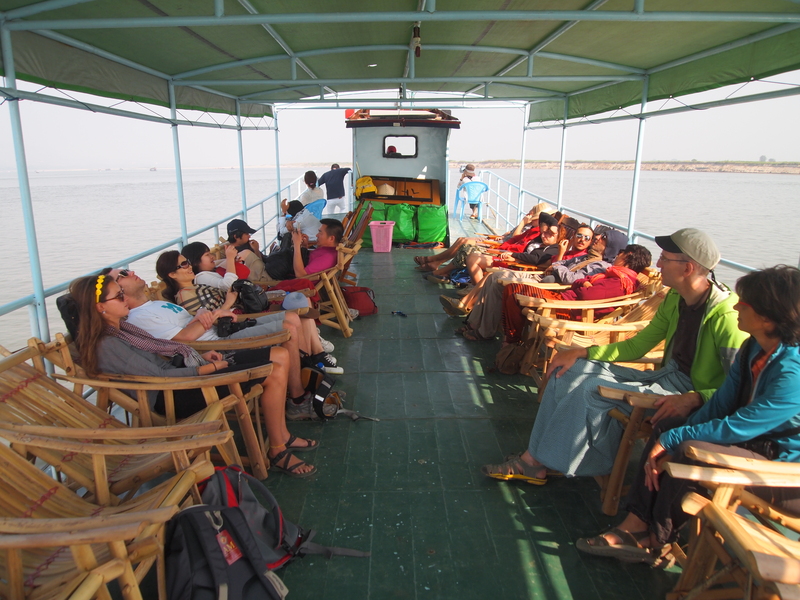 Tomorrow’s boat ride will be 10 hours, and we’ll arrive at a different destination: Bagan. 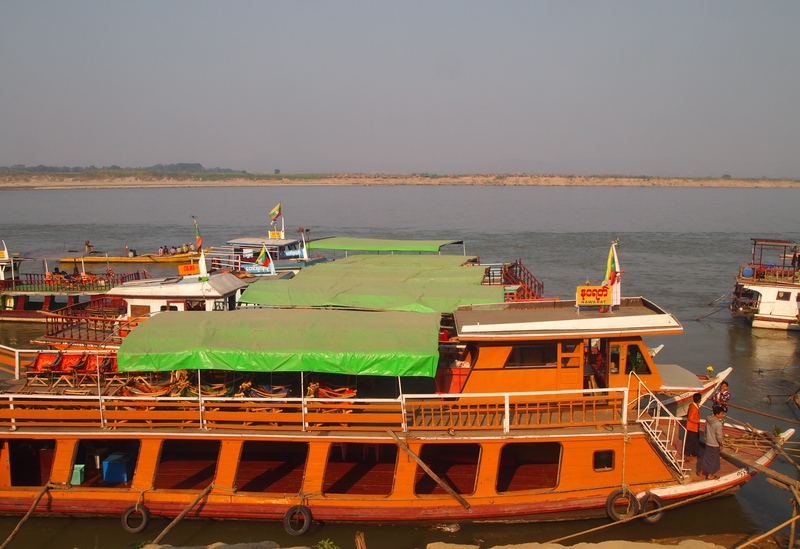 But today, we cruise for 1 hour south to Mingun, after which we’ll return to Mandalay. It’s a microcosm of the experience I will have tomorrow, a way to get my feet wet, so to speak. 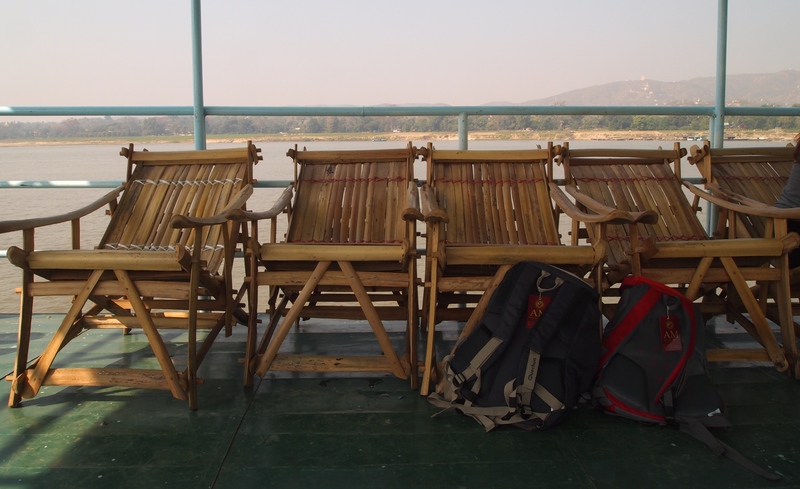 The boat has bamboo chairs that are a bit like shortened lounge chairs. It’s a warm day and we settle into the chairs for the duration. On the boat, I meet Shaun from Britain and Sarah from Scotland; like me, they teach English in China, she in Hong Kong and he in Wuhan. They came to China with the British Council and met through that organization. They’re not boyfriend and girlfriend, just very good friends who enjoy traveling together. 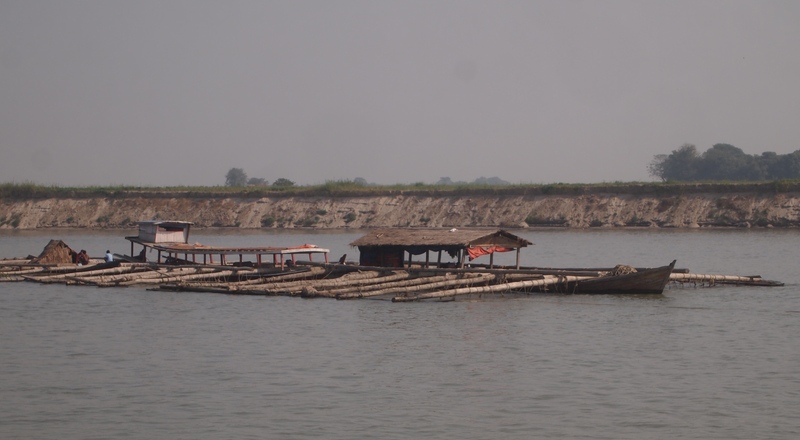 It turns out when we hit shore in Mingun, we all three share an ox-cart for our tour of Mingun. 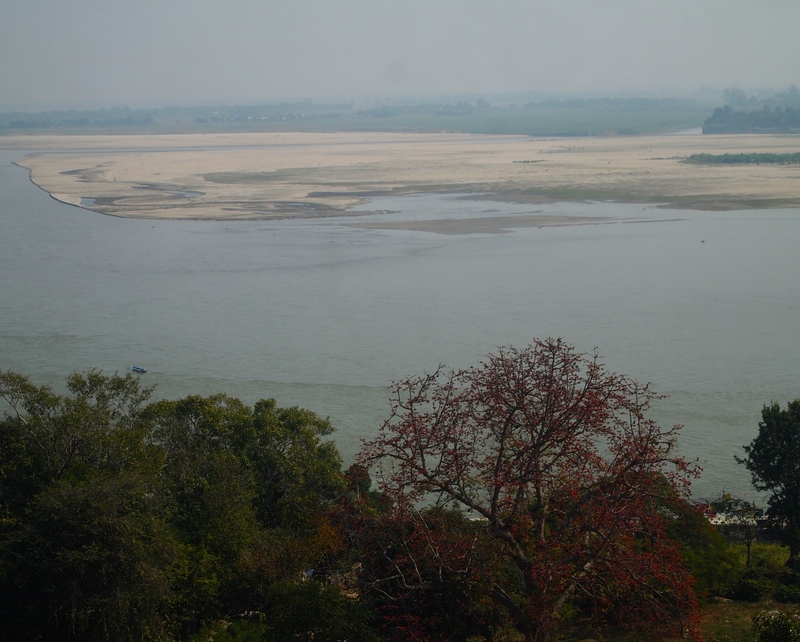 The Ayeyarwady River and its surrounds are very flat. There’s not much civilization along its shores, so there isn’t a lot to see or take photos of, though I love to take pictures so do so anyway. 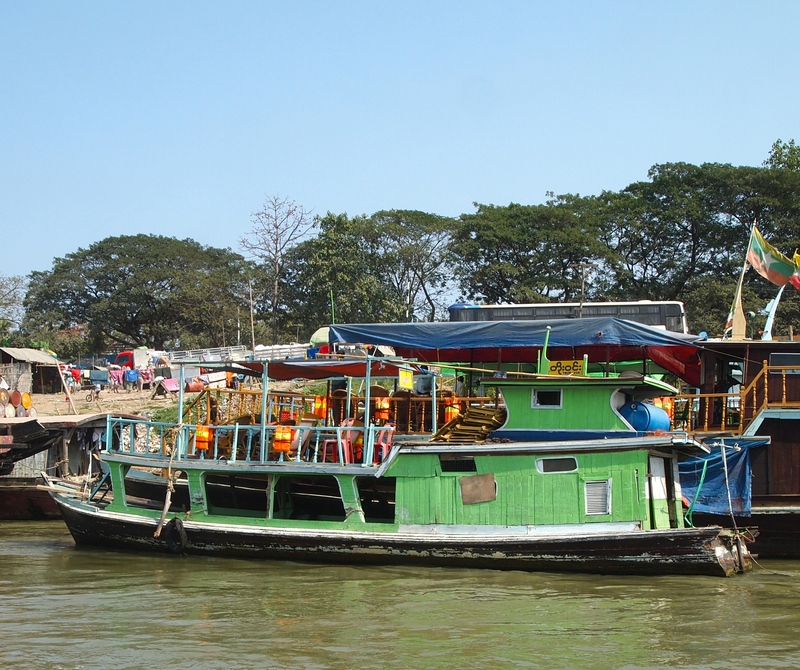 There are some interesting barges, fishing boats, small skiffs carrying families, and channel-marking boats. 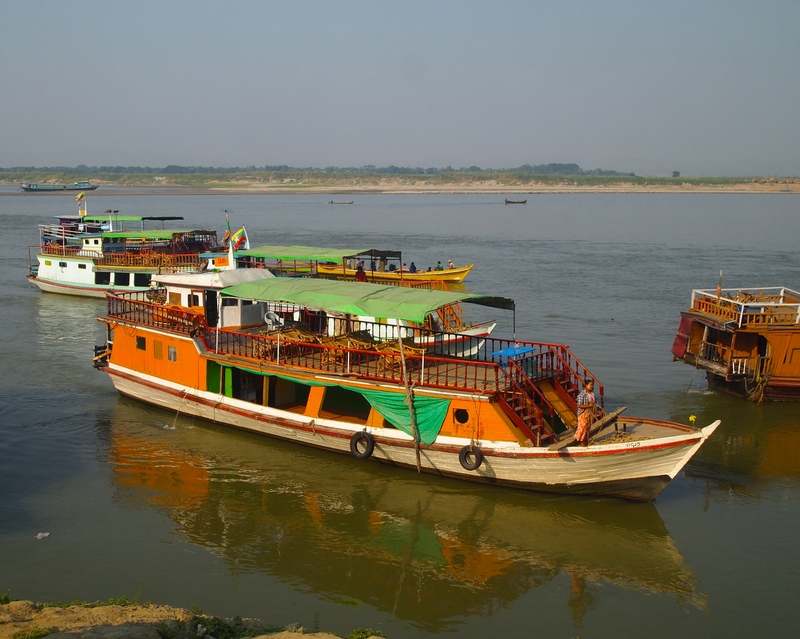 According to Encyclopedia Britannica: Irrawaddy River, the Irrawaddy River, Burmese Ayeyarwady, runs through the center of Myanmar (formerly Burma). 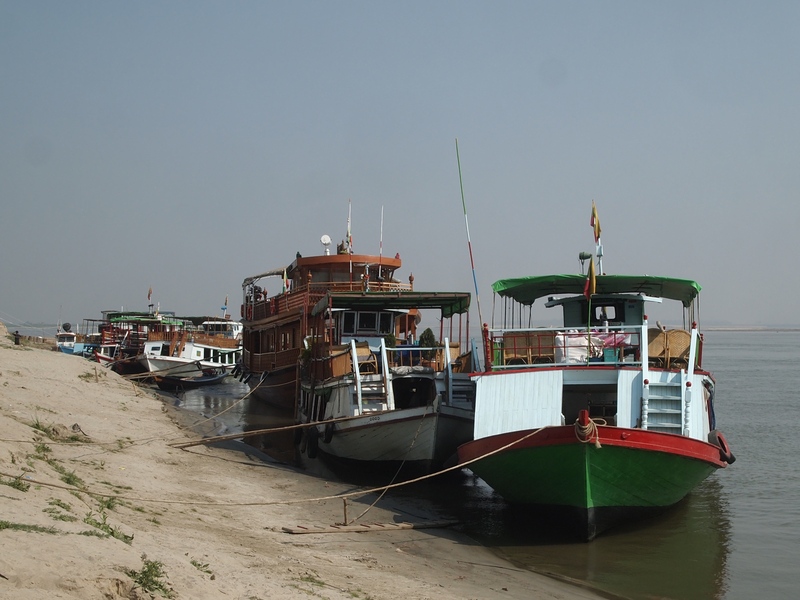 Myanmar’s most important commercial waterway, it is about 1,350 miles (2,170 km) long. 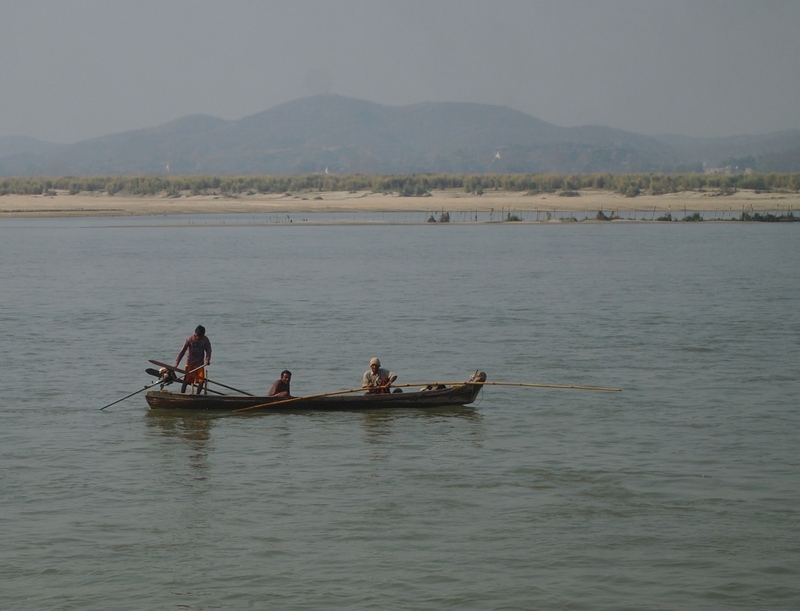 Its name is believed to derive from the Sanskrit term airāvatī, meaning “elephant river.” The river flows wholly within the territory of Myanmar. 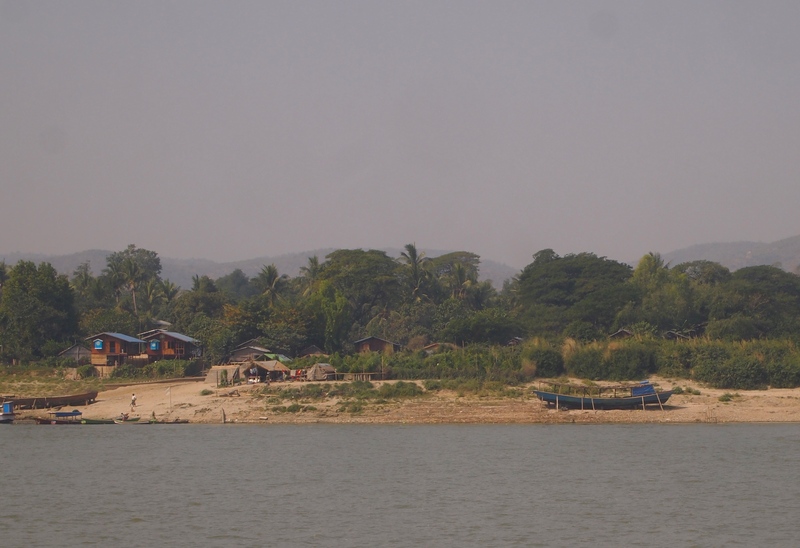 Its valley forms the historical, cultural, and economic heartland of Myanmar. We believe some of the people in boats along the way are measuring the depth of the river to mark the channels for the ferry boats. 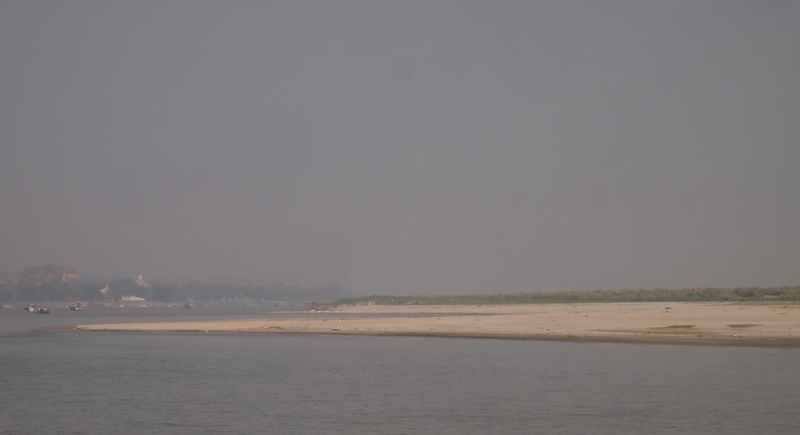 Apparently the river varies greatly in its levels due to the monsoon season from May-October and rapid snow and glacier melt-off in the summer. The lowest water level occurs in February, and the highest in August. We are here during the lowest of the low water levels, at the end of February. 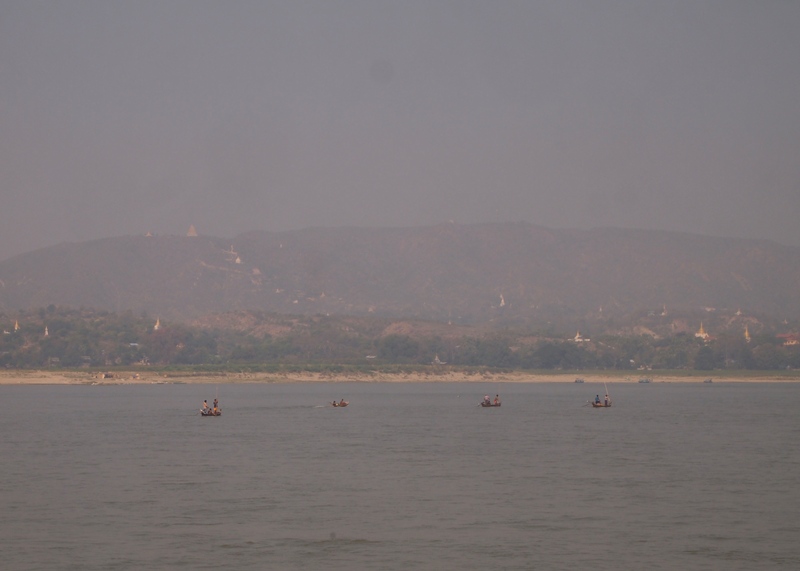 After about 45 minutes, we start to see the shore of Mingun, with its backdrop of pagoda studded hills. We see our first spotting of the huge Mingun Paya. When we arrive at the jetty, we disembark. We can either take a walk around town or take an ox-cart ride. 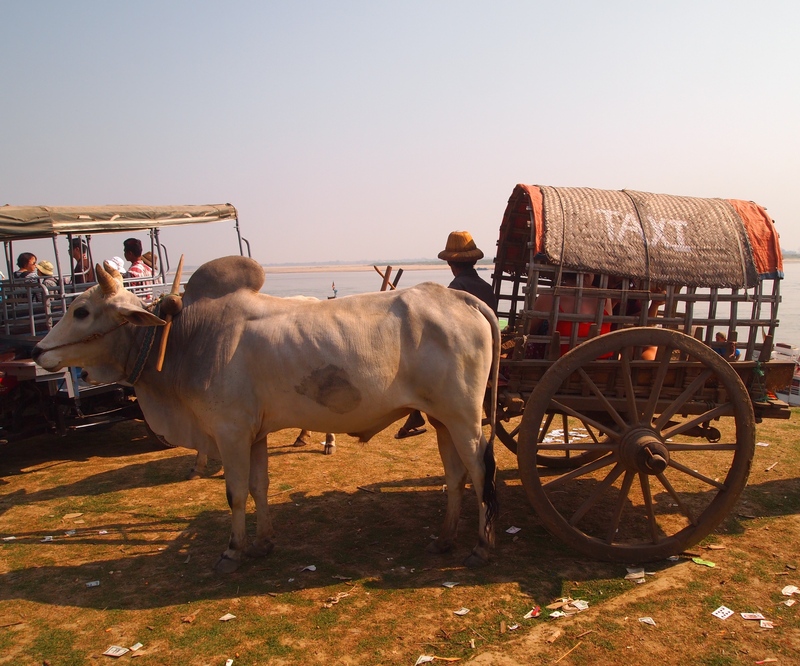 The ox-cart drivers are waiting for the tourists with offers too enticing to turn down. 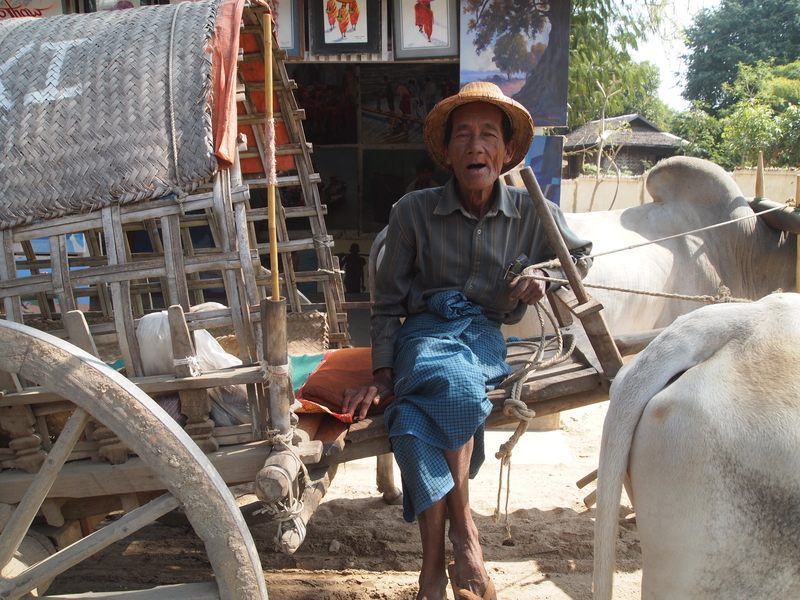 Sarah, Shaun and I find a gentle toothless old man with a hat who offers us a two-hour oxcart tour for 6,000 kyat, or about $2 each! We get settled into the ox-cart and begin our tour of Mingun. 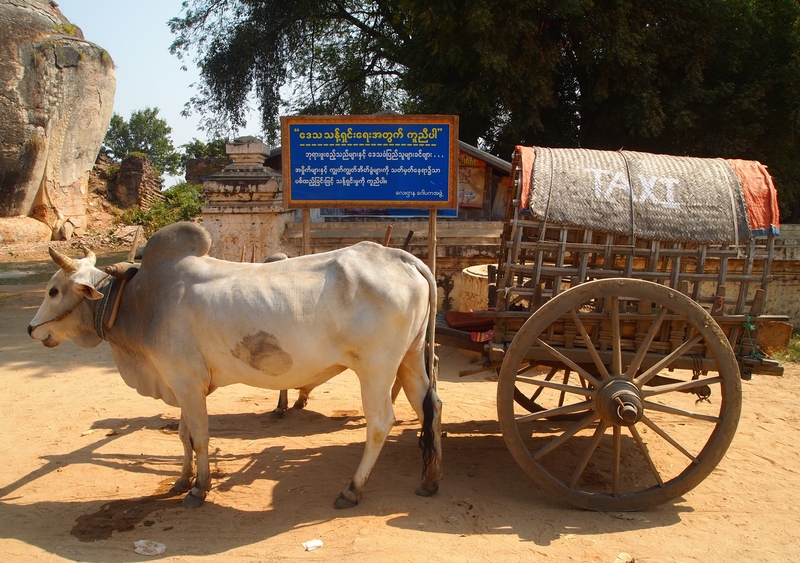 I love how our oxcart has “Taxi” written on its roof. 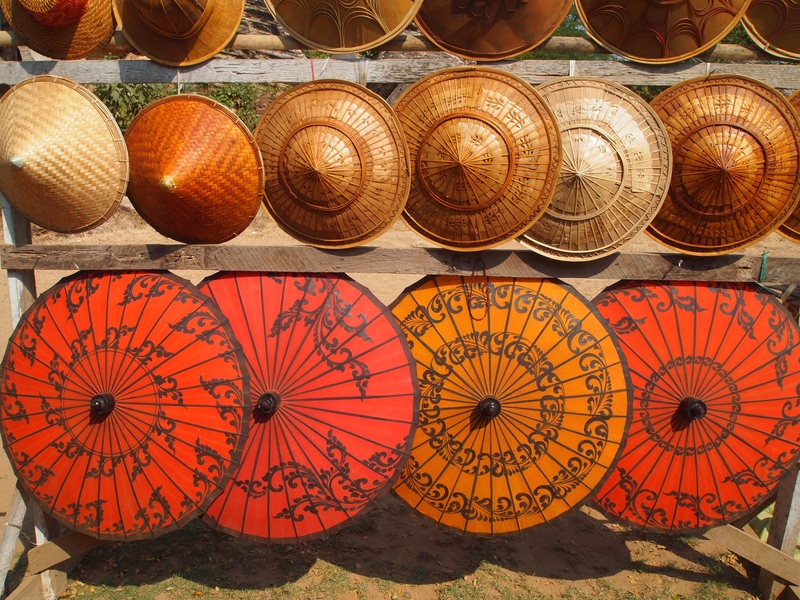 This is indicative of so many charming things we see in Myanmar. Our first stop are the Chinthe ruins. 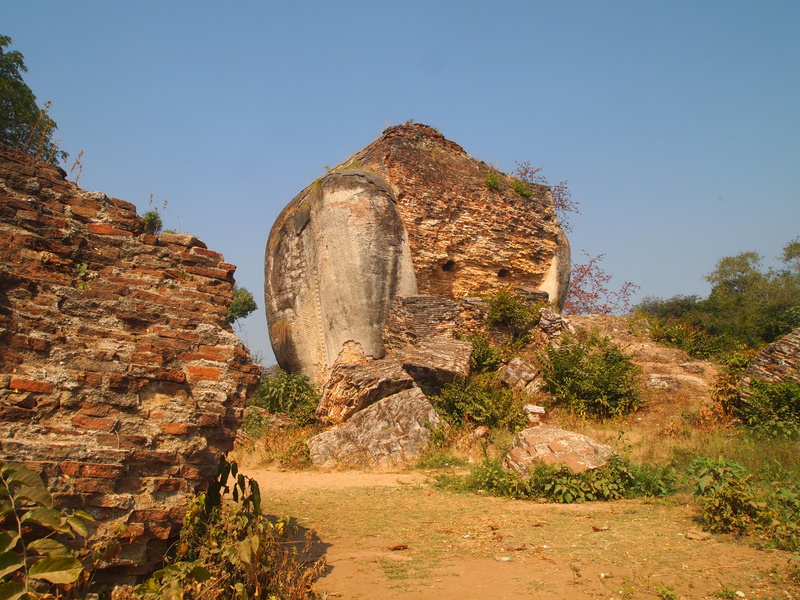 They’re the 29-meter-high brick and stucco ruins of the haunches of what would have been gigantic chinthe, Mingun Pagoda’s half-lion, half-dragon guardian deities (Lonely Planet Myanmar). 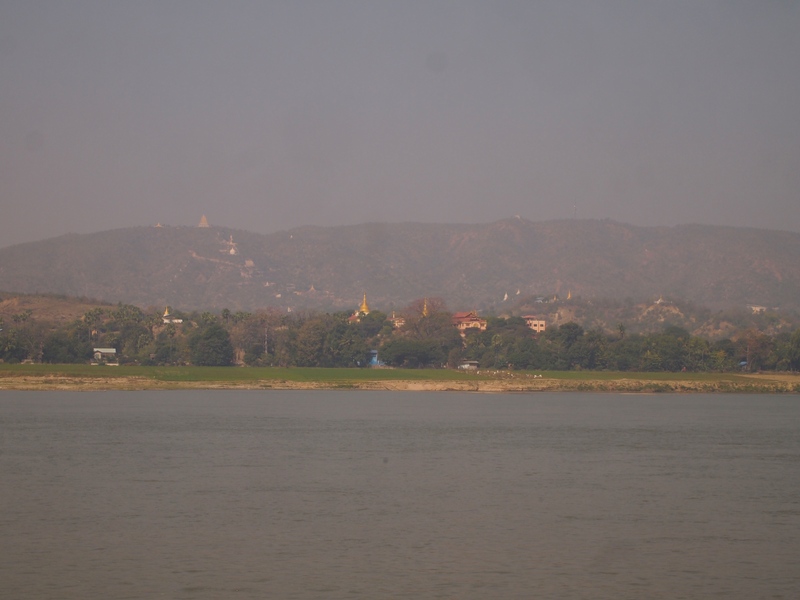 During the 1838 earthquake the heads of the giant Chinthe figures broke off and rolled into the Irrawaddy river, according to Renown Travel: Mingun Pagoda. Cute souvenir shops line the way to the Chinthe ruins. 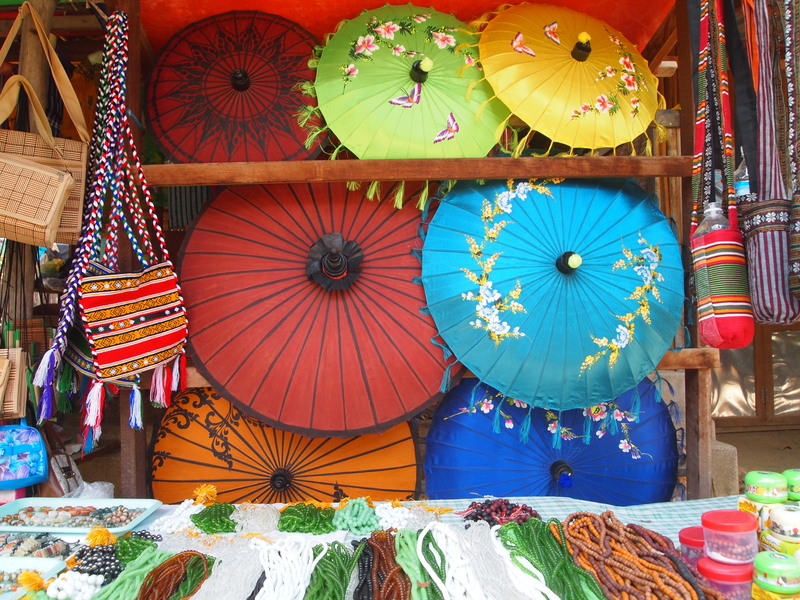 In one of the shops, I buy a piece of fabric to wear as a longyi, the Burmese skirt worn by Burmese women, for $5. While I visit Mingun Paya, next door to the Chinthe ruins, the woman who sells me the fabric sews a tie on to the rectangle of fabric. I pick up the skirt after we climb the pagoda. 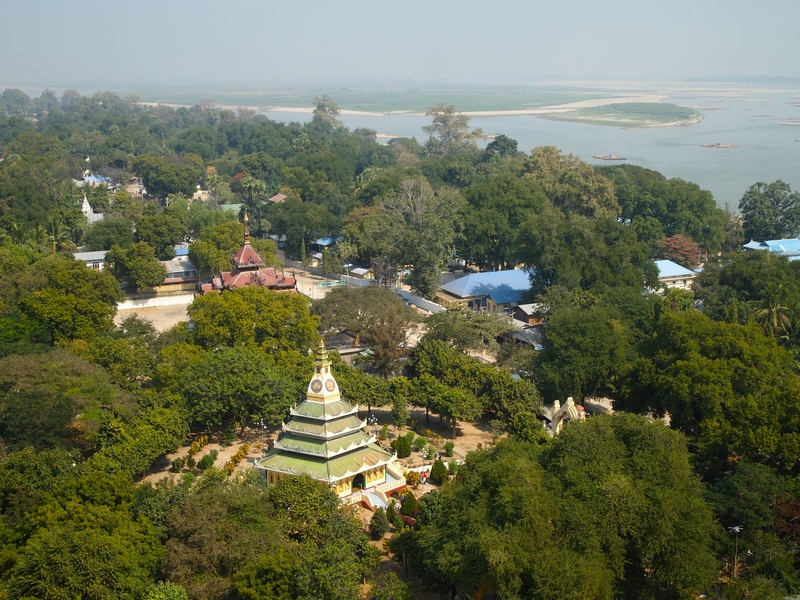 Across the way from the Chinthe ruins is the highlight of Mingun, Mingun Paya, also known as Mingun Pahtodawgyi, or Mingun Pagoda. 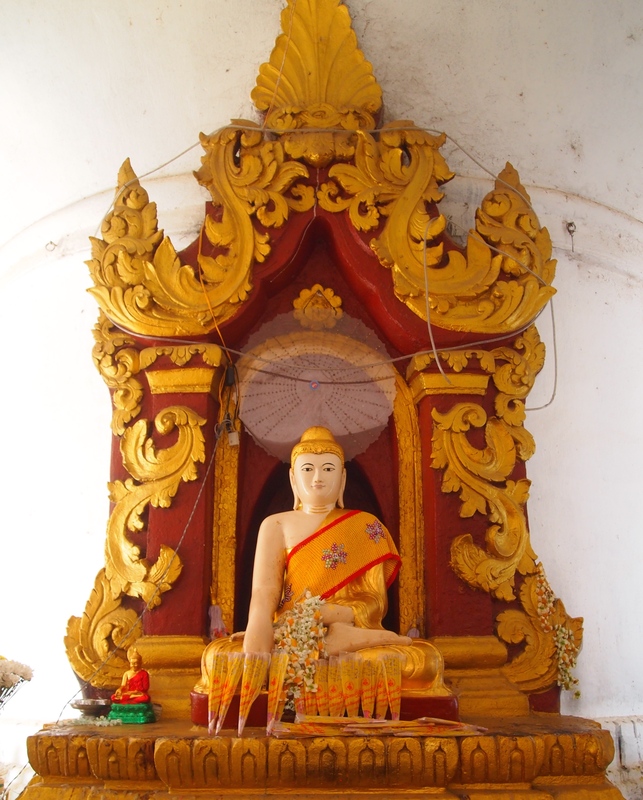 As is common when visiting any pagoda in Myanmar, we must take off our shoes. 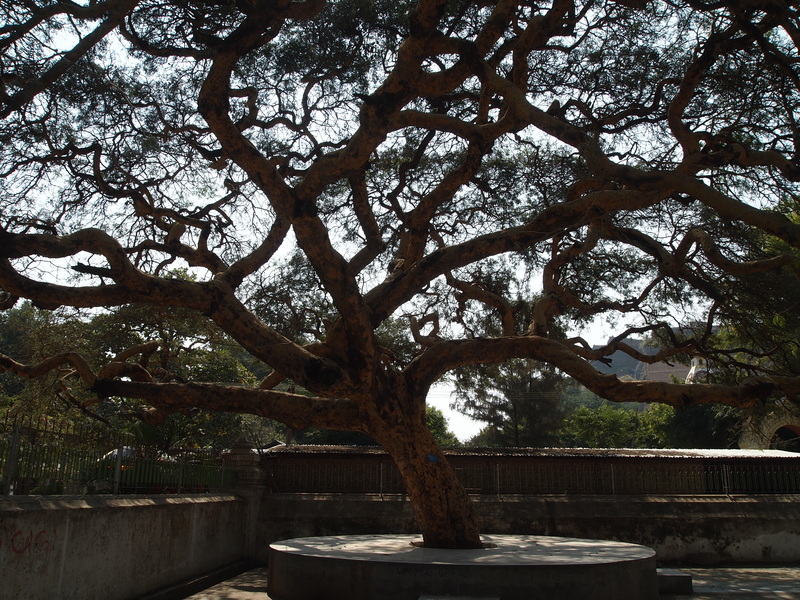 The Mingun Pagoda is a massive unfinished pagoda begun in 1790; it was meant to be the largest pagoda in the country. In 1797, when the bottom third of the pagoda was complete, work slowed considerably for several reasons. There were probably technical difficulties in building the largest pagoda of its kind at that time. Apparently, some of the slave labor also escaped. In addition, there was a prophecy going around that the kingdom would end when the pagoda was finished, deliberately slowing construction. Funding may have also been a problem. 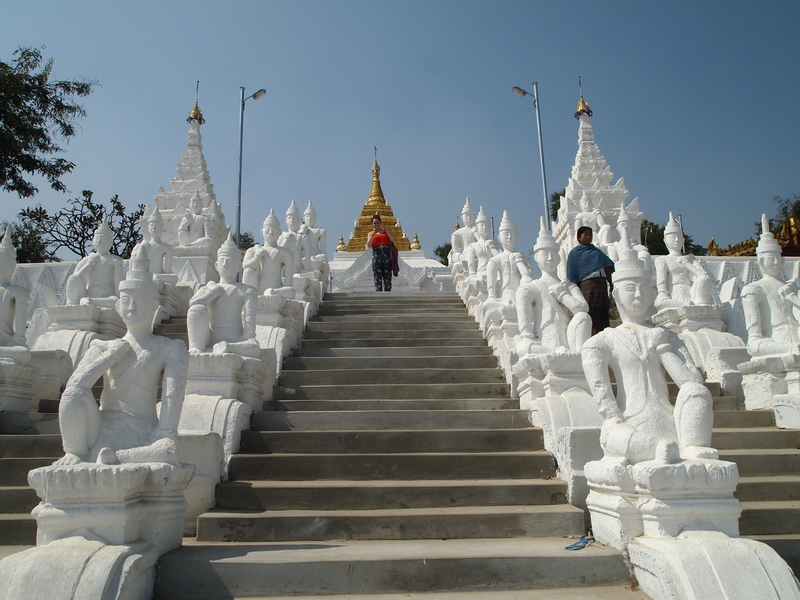 Work on the pagoda completely stopped when King Bodawpaya died in 1819 (Renown Travel: Mingun Pagoda). The structure is still huge, a 240 ft cube sitting atop a 460 foot lower terrace. 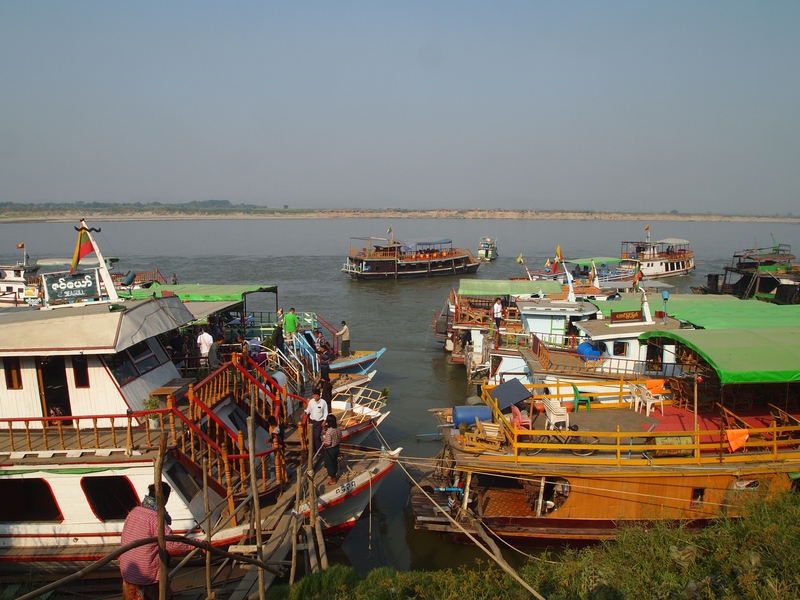 The massive paya makes for an impressive site on the banks of the Irrawaddy river. 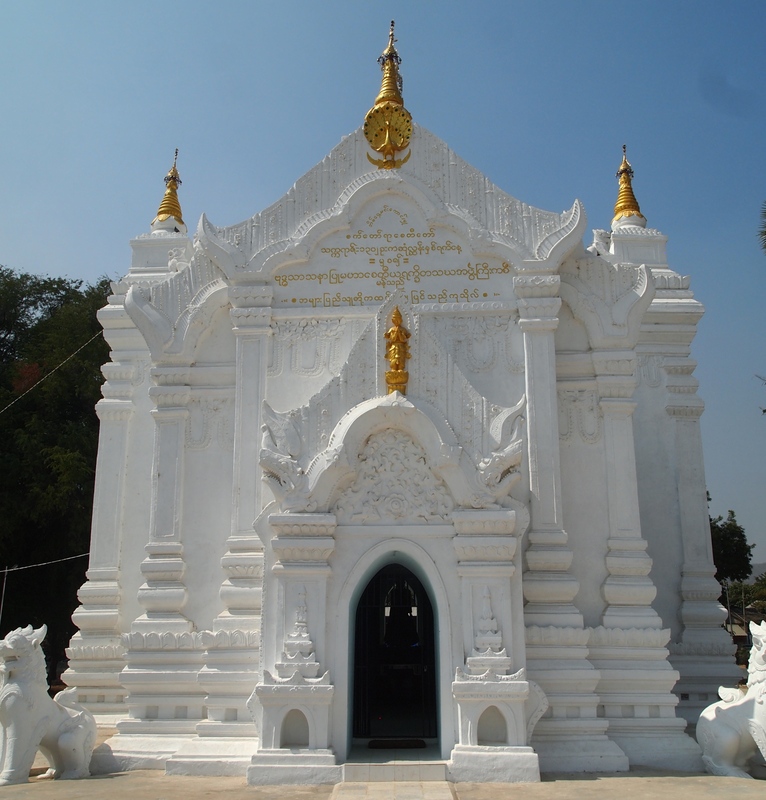 At the center of the 50 meter high pagoda facing the river is a huge richly decorated entrance. 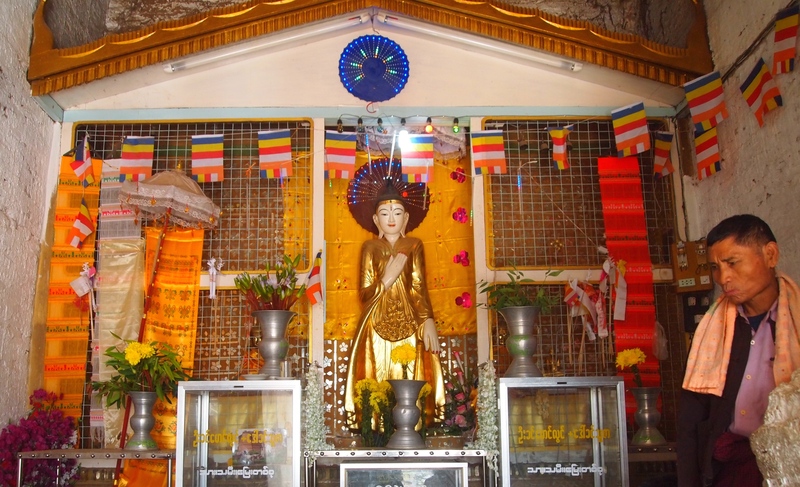 Inside the pagoda is a small shrine with a Buddha image. 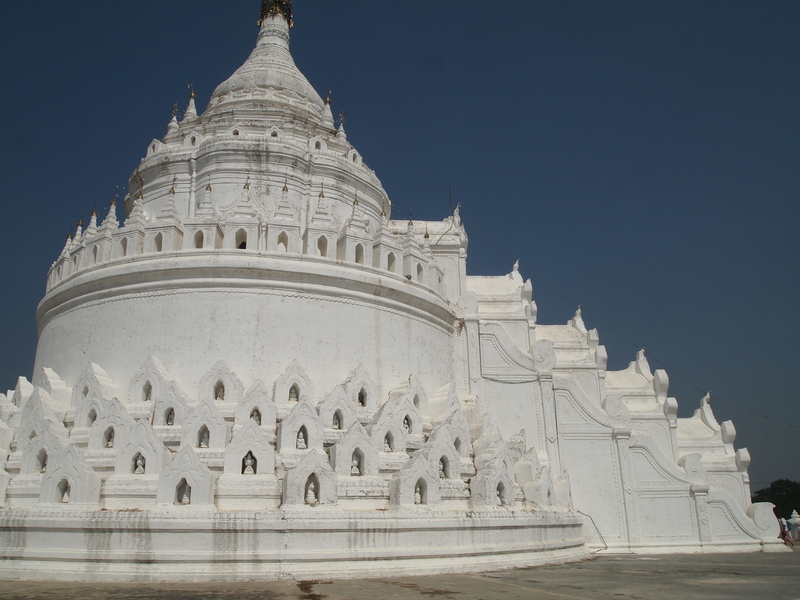 Two large earthquakes did considerable damage to the Mingun Pagoda. 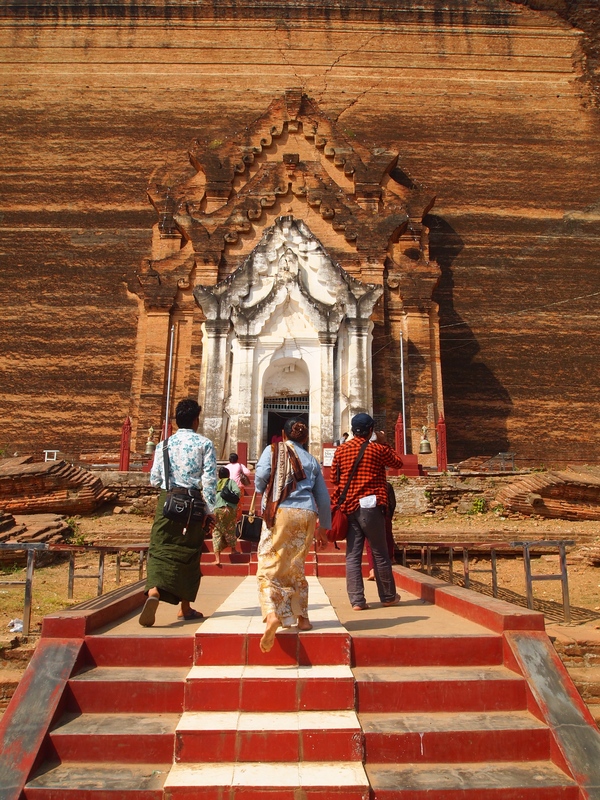 During the 1838 earthquake, large cracks appeared in the Paya’s structure. 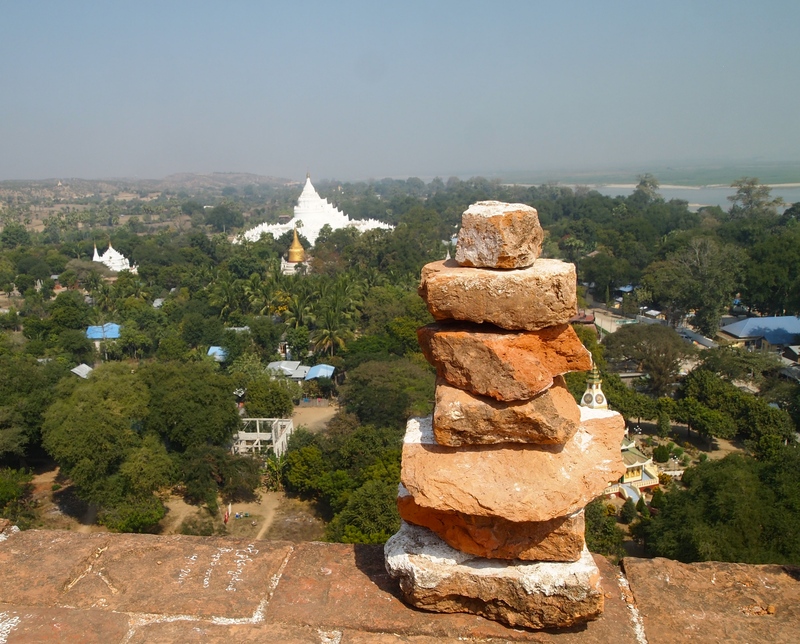 It is possible to climb to the top of the pagoda using a stairway to the right of the structure. It’s quite a scary climb, with many broken and narrow stairways and people trying to climb up and down in tight spaces. 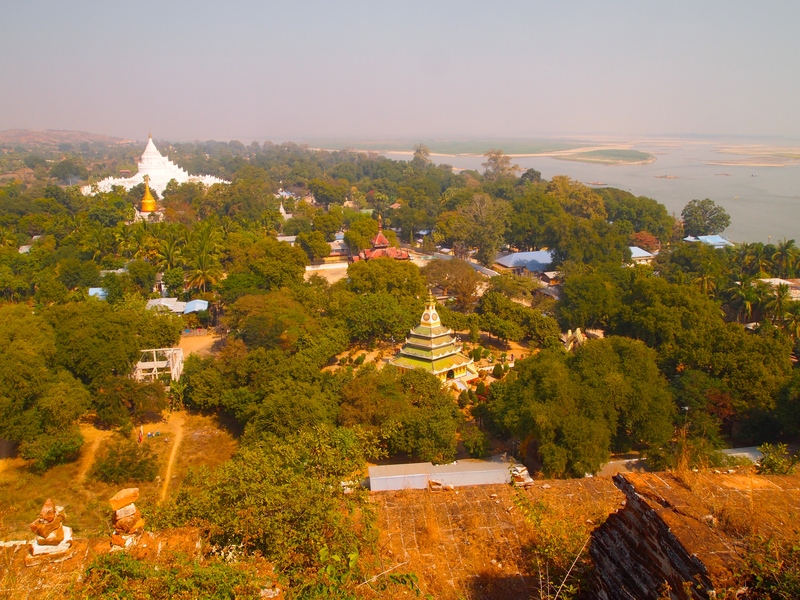 When we finally get to the top of what is often called “the world’s largest pile of bricks,” we have sweeping views of Mingun and the Ayeyarwady River (Lonely Planet Myanmar). There are no railings at the top of the paya, so it’s a little scary for people (like me) who might be afraid of heights. 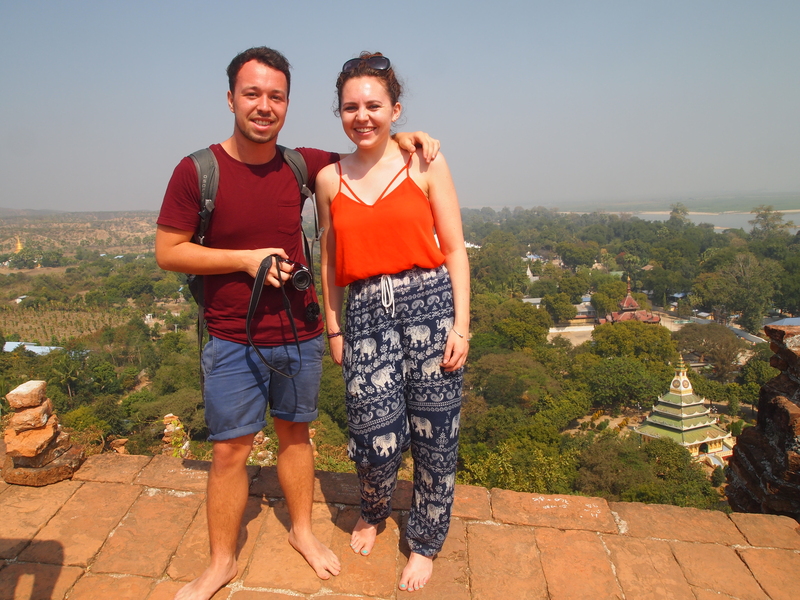 I take some pictures of Shaun and Sarah atop the pagoda. The views from here really are magnificent. 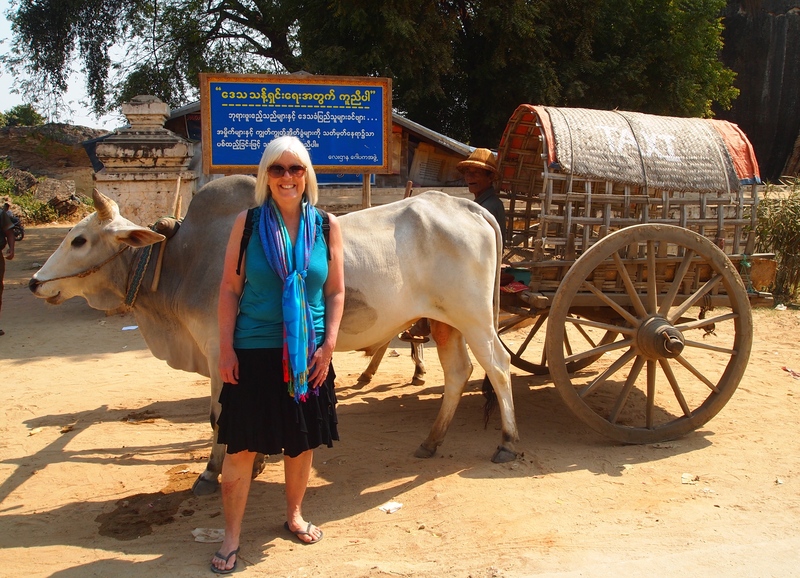 We return to our ox-cart where we take some pictures of each other with our kindly ox. 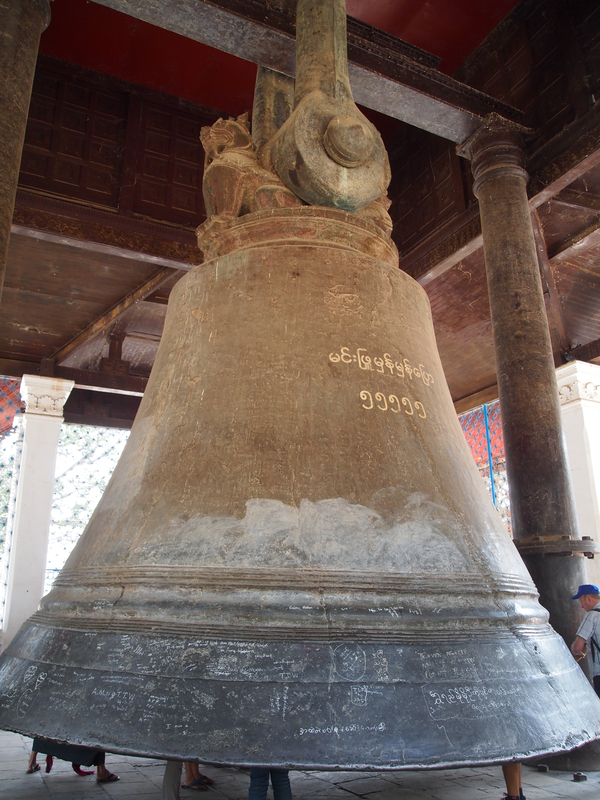 Next, we visit the bronze Mingun Bell, commissoned by King Bodawpaya in 1808 to be placed at the top of Mingun Paya. 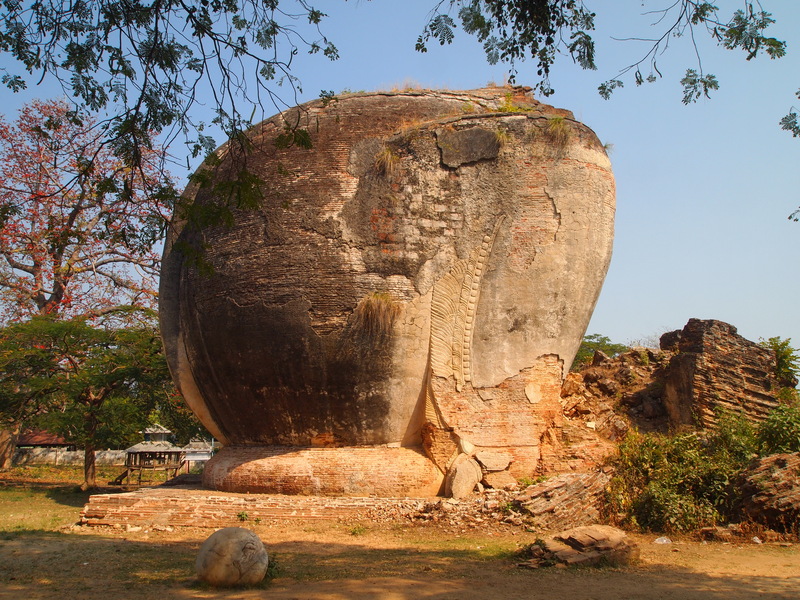 It’s 13 feet high and over 16 feet across at the bottom and weighs 55,555 viss , a Burmese unit of measurement equal to about 90 tons (Lonely Planet Myanmar). The weight, 55555 is inscribed on the outside of the bell, which is rung by striking it with a wooden log. People can climb inside of it; you can see people’s feet under it in this photo. 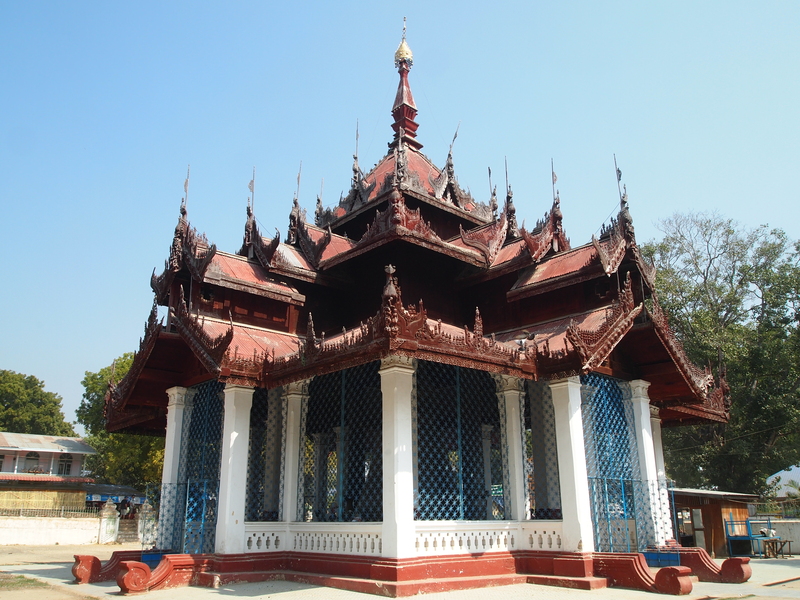 The bell is housed in a Burmese-style, multi-tiered pavilion. 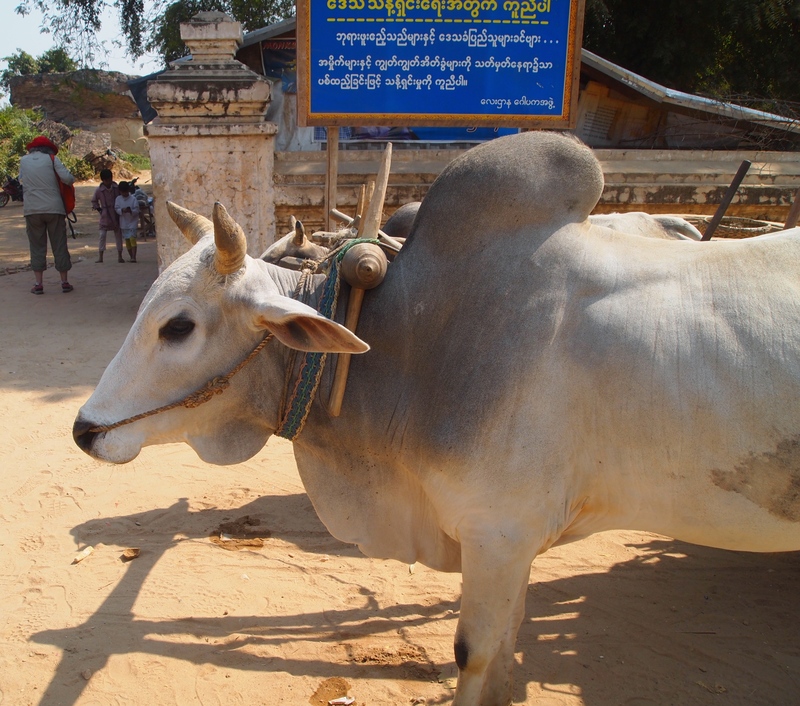 We get back into our ox-cart, where I snap a photo of Sarah poking her head out of the front of the cart. 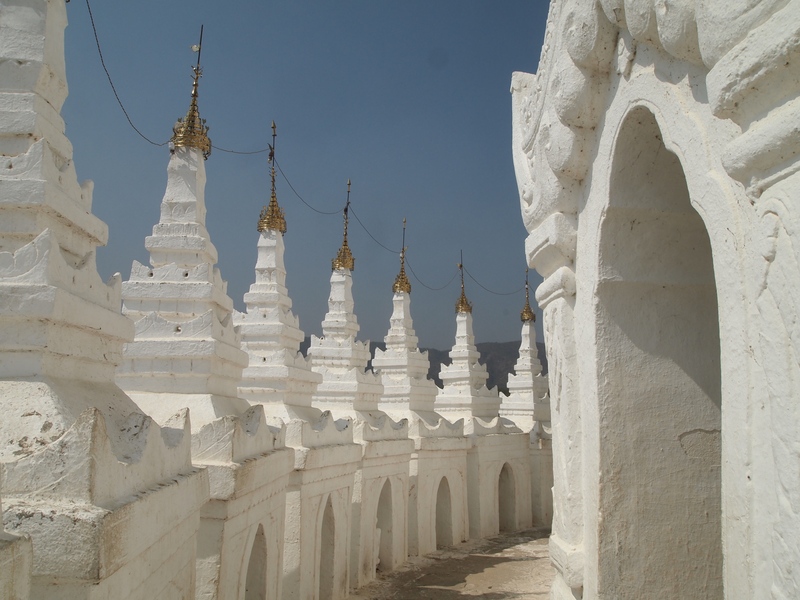 Next, we visit Hsinbyume Paya, built in 1816 possibly using materials taken from Mingun Paya. It rises in seven wavy whitewashed terraces representing the seven mountain ranges around Mt. 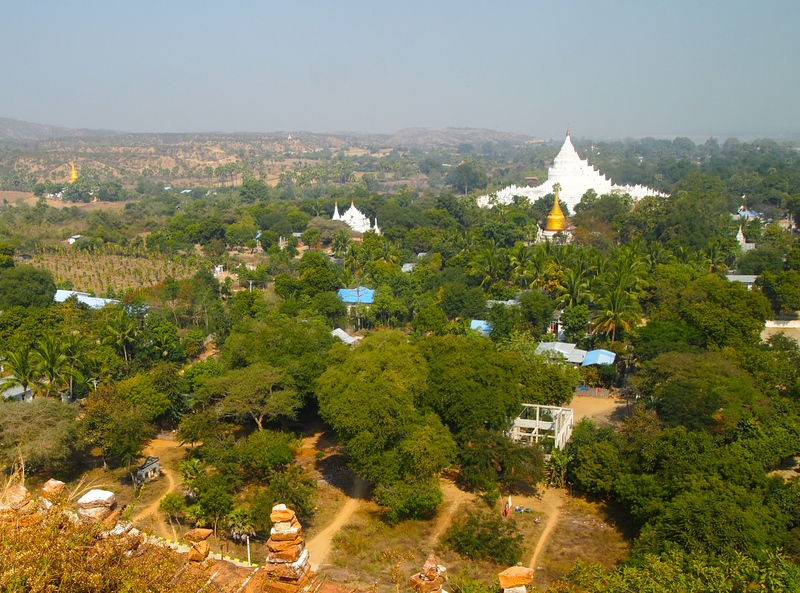 Meru, the mountain at the center of the Buddhist universe (Lonely Planet Myanmar). We stop at some souvenir stands to buy something to drink, as it’s quite hot today. Our oxcart driver, much more laid-back than my horse-cart driver in Ava, is waiting patiently for us. 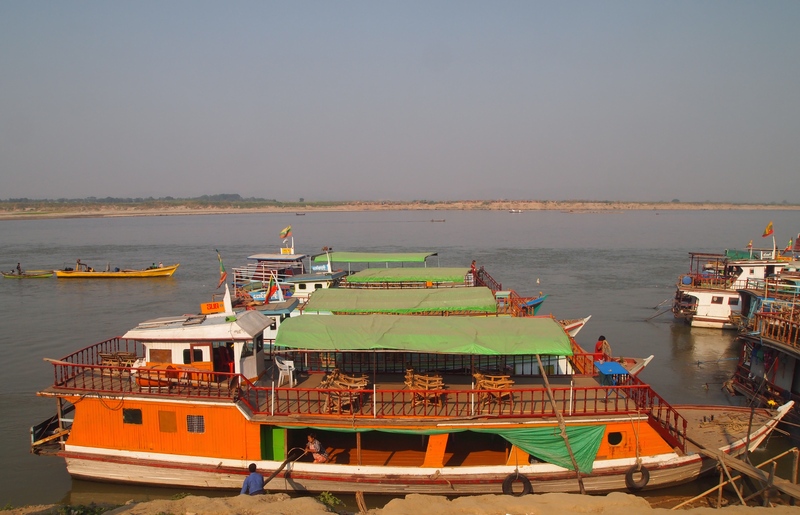 Finally, we stop at Pondaw Paya on the banks of the Ayeyarwady. 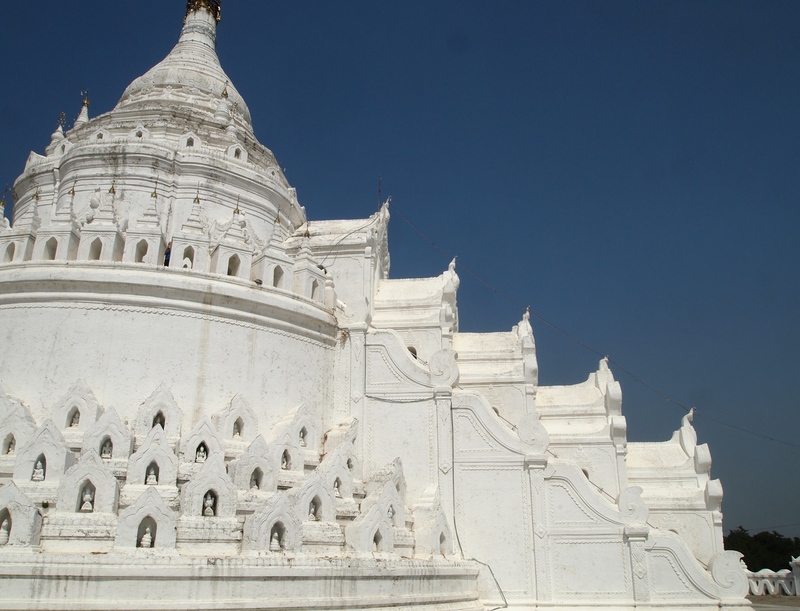 This is a small-scale version of what Mingun Paya would have looked like if it had ever been completed. 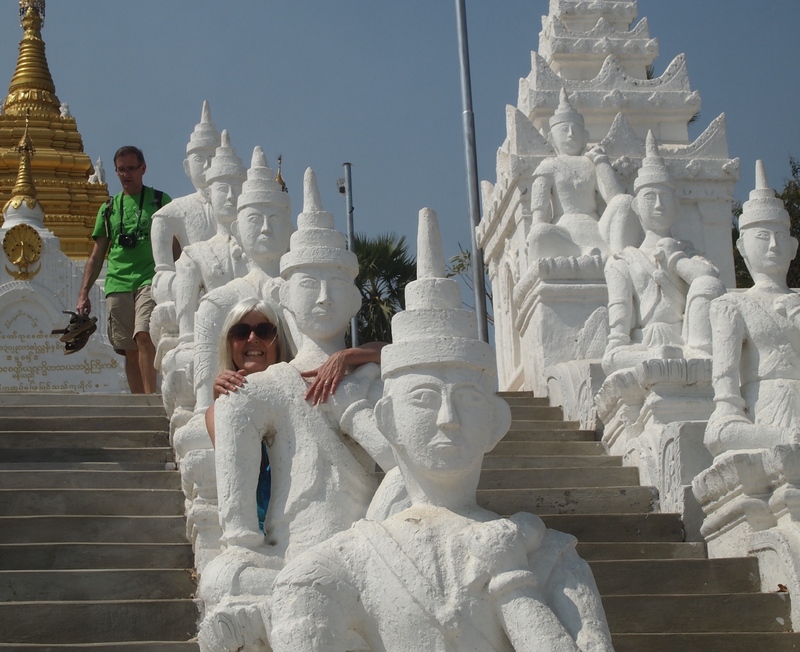 We do some fun posing with the figures at the pagoda. Inside Pondaw Paya are some very serene looking Buddha figures. As we’re walking back to our boat, I see the woman with the huge camera who snapped at me yesterday for honing in on her model. I tell the story to Sarah and Shaun and they’re baffled why someone would act so proprietary about a model to whom she likely paid a very small fee. 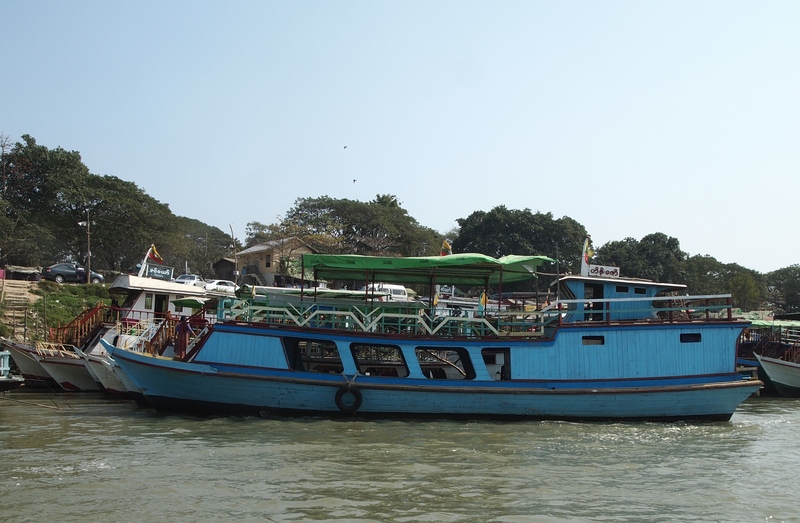 On our way back down the river to Mandalay, we talk to some friendly Germans on the boat who recommend a hotel in Yangon called the Agga Youth Hotel. I take note because I haven’t yet reserved a room in Yangon and they say the location is superb and the staff is great, as is the breakfast. 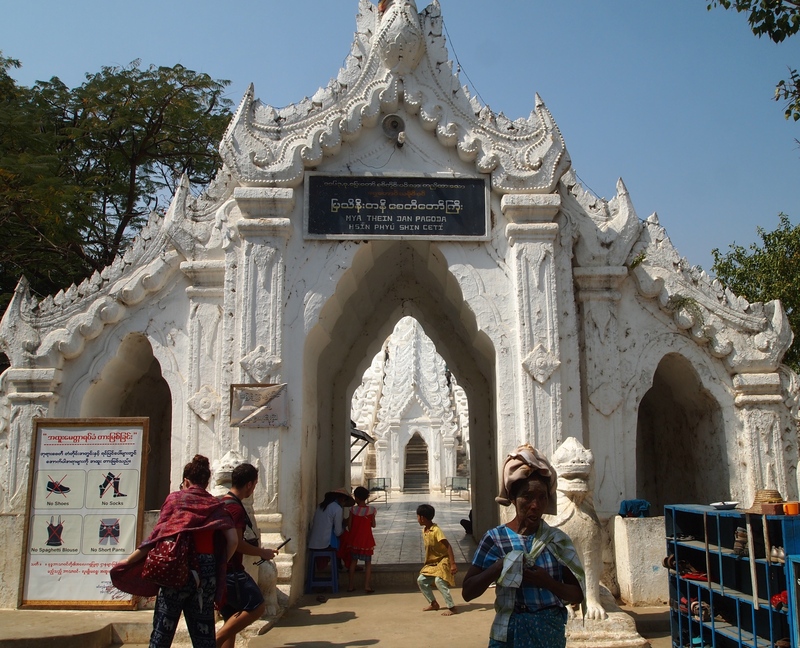 Shaun also recommends a free English tour in Yangon by someone named Sandie, and he and Sarah both recommend taking the Circle train in the westerly direction. I ask the Germans if they’ve seen Enlightenment Guaranteed, about two German brothers who go to Tokyo to spend some time at a Buddhist temple. They haven’t seen it but take note of it. I tell them it’s one of the most hilarious movies I’ve ever seen. Finally, we’re all sharing stories about Cambodia and the Khmer Rouge and how horrible they were, and the German says Germany did the same thing under Hitler, so as Germans they have to own their part in their horrific history. 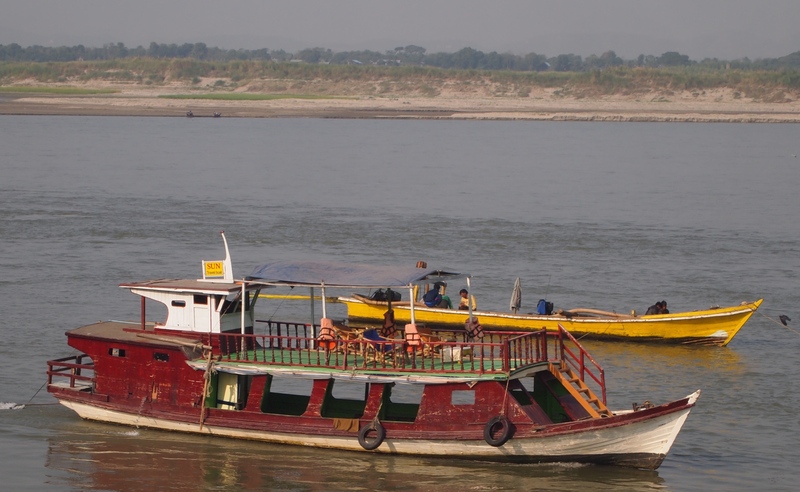 This is what I love about slow travel such as long leisurely boat rides, talking to fellow travelers and sharing stories and lessons learned along the way. 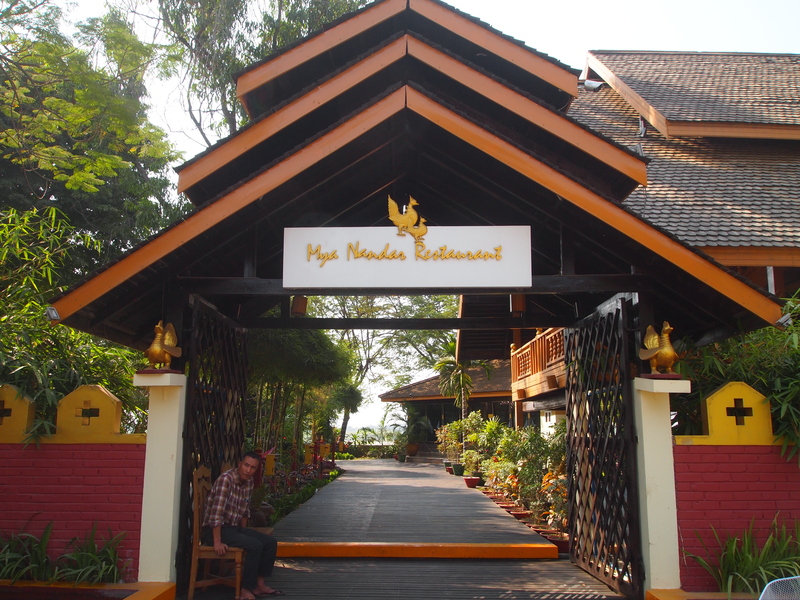 Mimo is waiting for me at the boat dock, and we head directly to a chicken and vegetable lunch at a riverside restaurant in Mandalay at 1:30 p.m.
After lunch, we’ll head to the Mandalay Royal Palace. So glad you fell in love with Myanmar. It’ll be so different in a few years, once the tourist industry gains more of a foothold. I was particularly interested in Mingun because we never got there as we caught the end of the monsoon season and our trip got rained off. 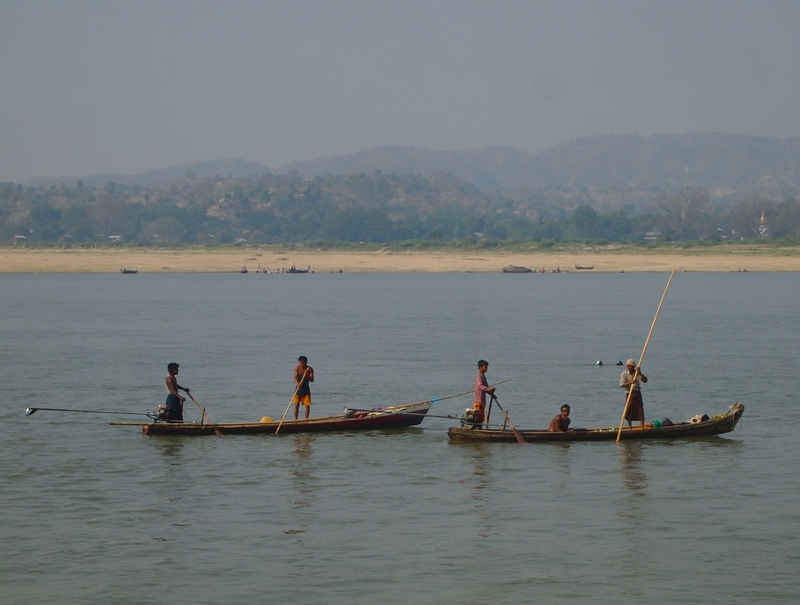 I have memories of teetering across a gangplank to get to a very steep and muddy riverbank and being helped up it by solicitous Burmese holding umbrellas in one hand and me up in the other! Once again, you did a wonderful job of capturing what you were doing and what the area looked like, as well as facts and personal anecdotes. 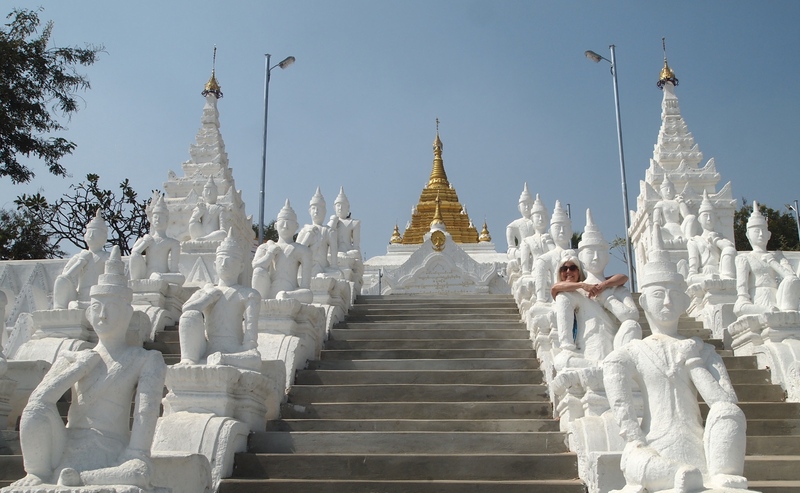 Those Pondaw Paya were really something – I’m surprised they’re so white. Although I had to look to find you posing with them in the one picture – I felt like I was playing “Where’s Waldo”. Your taxi driver did a good job – much better than others you’ve had. Thanks so much, Nancy. It was fun to write this post because I have such good feelings associated with this mini-journey. I found Pondaw Paya really dazzling with all that white. Haha, that’s so funny that you felt you were playing “Where’s Waldo?” when searching for me in the photos. So funny. A wonderful day Cathy, slow, easy and real travelling. 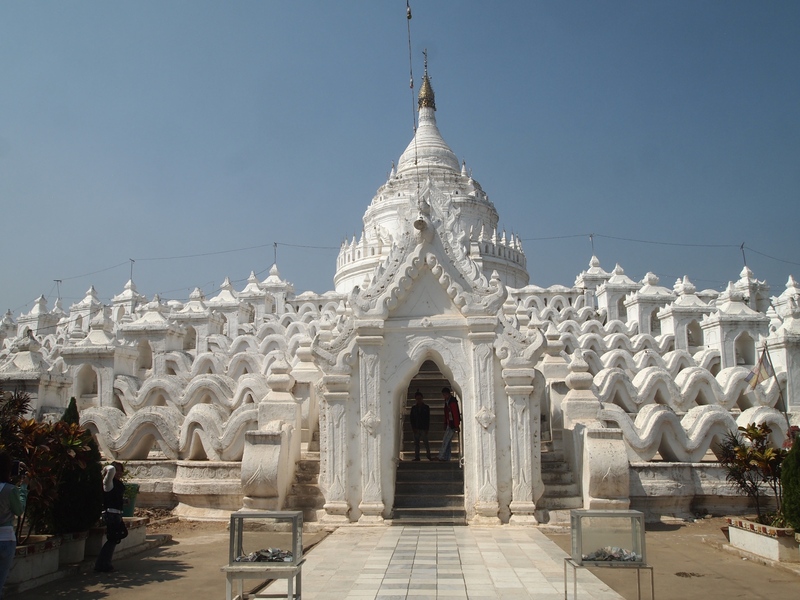 The white Hsinbyume Paya is amazing, was it very hot there? What a fascinating country. I had to smile at those people inside the bell and wonder if any one would ring it while they were inside!!! I think if they had, it would have damaged my sense of hearing, Pauline! This is a lovely post, Cathy. I settled into that oxcart with you and prepared to be wow-ed by those temples- and I was! 🙂 I can feel you relaxing and smiling in the warmth and good company.